This is the broader version of a lot of smaller arguments we have been having again and again and again, so I thought it would be good to have broader one to get this figured out. It seems like while everyone agrees that items used in the outdoors/ outdoor activities are on topic, but we seem to be going round and round about the intersection. Knot for adjusting the length of a loop using both ends of a cord could be useful hanging a whistle around one's neck but also for jewellery. Storing hunting firearms and ammo in a safe not designed for them? is useful for storing both hunting and non-hunting firearms. What is a good knot to tie a short loop around a bracelet? Could be used for storing a hair band while backpacking or just in regular life. There are other examples, but those are the most recent ones I remember. Sometimes we leave them open, and sometimes I have edited them to remove the parts useful in both areas. Personally, my opinion is that only whether or not something falls inside the green circle matters. Yes, something could also be useful in non-outdoor situations, but I don't think we should exclude that. How can I sharpen a knife to cut computer boxes open? should be edited to be useful for both, and left open. How can I sharpen a knife? I don't see why we are excluding the things that fall into the intersection by closing questions that are not specifically about the outdoors. Any question that has outdoors significance should be kept open here. I've already stated here and here that some questions might require edits to clarify how they fit into the outdoor situations. The only reason for the edits is to make it clearly in scope for any crowd that might visit us. The rule of thumb that I go by is to see how the answers to the question could add value to anyone out in the outdoors. In the recent situations where we've had debates on on-off topic questions, the answers have been so obviously helpful for outdoor situations that we've voted to keep the question on site (and made edits as well). Having said that, I do not feel this debate will stop here. Not everyone might agree on how a question could obviously add value to a outdoor situation (the ones you mention that fall in the intersection). That's also because we as humans have different perspectives. Personally, I do not see any harm in these debates as long as they are civil. It helps us to grow as a community while respecting the different views that prevail out there. Maybe we are asking the wrong question. If a question is not clearly in scope, can or should we edit it to be clearly in scope? Can we = Yes (related post) every post on the site is community property. Should we = I think we should, but I this is probably the root issue that needs to be discussed. I tend to agree with paparazzo's answer but my stance is far less extreme. I agree that we shouldn't twist, stretch, and contort things so virtually every topic is on topic. At the same time I don't think just because people are likely to get a more technical answer on another stack that the question should be off topic here. What gets measured gets managed - even when it's pointless to measure and manage it, and even if it harms the purpose of the organisation[sic] to do so. Personally I don't care if we ever graduate. I don't come here or contribute so we can graduate. I come here and participate because I enjoy visiting my virtual friends by reading their questions/answers/comments, learn new things, and share my knowledge. I'd rather we were a bit more aggressive about regulating scope, but I definitely don't want a very narrowly defined scope either. In summary I think the debate is going to continue, but if people focus more on the core identity of the site, instead of graduation, then I think the discussion will be less frequent and less contentious. "Useful outdoors" is not the stated scope from the tour. The stated scope from the tour is "outdoor activities, excursions, and outdoorsmanship". Almost anything can be useful in the outdoors. 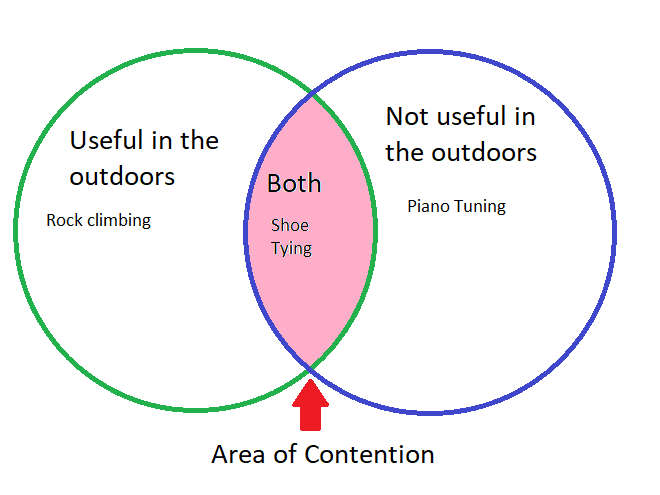 Could argue an outdoor concert brings piano tuning into scope. I suggest we go by scope from the tour. If that needs to be changed then fine. Until it is changed that is the scope that should be applied. About and specific to are not the same. Specific is also about expertise. Is it indoor based but this site would have expertise. The pendant knot was not outdoors but you could expect this site to have expertise. I know you disagree but nothing about the nutrition question (as stated) was specific to the outdoors. This site does not have expertise in nutrition. Stack Exchange is a network and taking in anything that can be useful outdoors dilutes the network in my opinion. That definition could absorb a good share of many of sites. Health is clearly a perfect fit for nutrition. This question is a good example. Is it an outdoors question because it is an outdoor jacket. Pretty much any jacket is for outdoor use. Is there anything about sewing that is specific to the outdoors? This is not a field repair. crafts.stackexchange.com has a sewing tag. Unless this is a pocket type very specific to an outdoor activity jacket to me it is out of scope (but I am not going to VTC). Cooking is a site that has numbers. They have a strict scope. They don't take nutrition questions as in what is a healthy diet. They don't take recipe questions. Poker is a site with low count and they don't take in questions on other card games (even if they are played with a poker deck) to bring in numbers. I don't think that making this site a catch all for anything that can be useful outdoors is good for the network or this site. It is inconsistent with the stated scope from the tour.